As part of the Dark Room blog tour, I am pleased to welcome author, Tom Becker, onto the blog to talk about his new YA horror book, Dark Room, published later this week by Stripes. 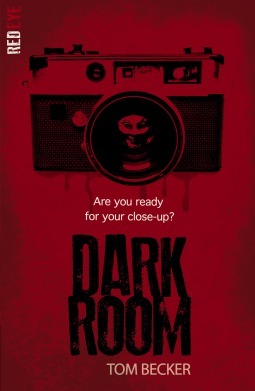 You can read my review of Dark Rooms in my previous post from earlier today. My new book, Dark Room, grew out of an idea envisaging a serial killer targeting people taking selfies. Even though the story evolved and changed over time, photographs still play a central role. The glamorous teenagers of Saffron Hills pose for endless selfies, whilst a killer known as the Angel Taker captures his victims’ terrified final few seconds of life on film. And it is a photograph of her deceased mother Sidney that prompts the heroine Darla to start digging up the secrets of Saffron Hills. I confess that maybe there was a small amount of revenge going on here, as for years I hated being in photographs. My parents still have albums full of pictures of me as a boy, usually with a big grin and ludicrous hair. But when I became a teenager photos started to bother me. They started to feel forced and unnatural, which made me feel more awkward. Suddenly I was grimacing and shying away from the camera, which only made me look even more ridiculous. It wasn’t a massive deal or anything – just if I could avoid photos, I would. There were times when it could look like some kind of weird narcissism, drawing people’s attention to yourself while simultaneously claiming to be trying to avoid it. But I was just preferred my own memories. People seem desperate to document everything these days – to my mind at least, at the expense of actually experiencing it. Every time I see a band playing on stage, it’s through a forest of mobiles as the crowd films them. Why they just watch and listen? Isn’t that what they came for? So when it came to photos, I became an Artful Dodger. I reckon I have only a handful of photos of myself from university and all the way through my twenties. Which is fine, I haven’t exactly robbed posterity of a record of the moon landing or anything like that. Even now I’m married to my wife – who likes to take the occasional snap, and bemoans my habitually reluctant expression that she terms ‘scrunch face’ – I don’t take any photographs myself. My current mobile features all the latest, cutting-edge technology from 2002 – it will, if I am very careful, allow me to send a text and receive the occasional phone call. But selfies are out of the question. Thank you Tom for a brilliant post. I can vouch for the lack of photos of you as it was really difficult to find one for this post!